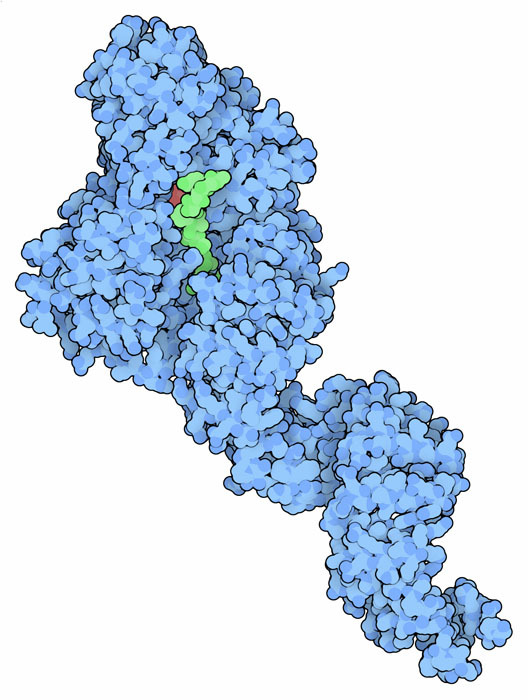 Human O-Glc-Nac transferase bound to a small peptide from casein kinase (green). Cells use many methods to control their proteins, to make sure that they perform their jobs when and where they are needed. Some are brutally irreversible, such as the continuous breakdown of obsolete proteins by the ubiquitin/proteasome system. Others, such as the modulation of enzyme function by allosteric motions, are far more subtle and respond to the second-by-second needs of the cell. Often, chemical groups are added to amino acids in proteins to modulate their function. Phosphate groups are a familiar example: they are widely used to turn signaling proteins on and off, controlled by a diverse collection of kinases and phosphatases that add and remove these regulatory phosphate groups. The sugar N-acetylglucosamine (GlcNAc) is also widely used to regulate protein function. It is added to serine or threonine amino acids, often at the same sites that are modified with phosphate groups. In contrast to phosphate modification, however, GlcNAc is added to hundreds of different proteins by a single enzyme, O-GlcNAc transferase, shown here from PDB entries 3pe4 and 1w3b . The enzyme transfers the sugar from a carrier molecule: UDP-GlcNAc. GlcNAc is a modified form of glucose, and the levels of UDP-GlcNAc reflect the levels of glucose available to the cell--in fact, 2-5% of all glucose is used to make UDP-GlcNAc. Taking advantage of this connection, GlcNAc transferase acts as a glucose sensor, modifying proteins with GlcNAc when glucose levels are high, and thus activating processes such as insulin-like signaling and transcription of genes involved in glucose metabolism. The enzyme O-GlcNAc transferase has several functional parts that work together to perform its job. A long corkscrew-shaped section, shown at the bottom here, recognizes the proteins that will be modified, perhaps with help from some accessory proteins. The catalytic domain, shown here at the top, lines up UDP-GlcNAc with a serine amino acid on the target protein, and transfers the sugar to it. 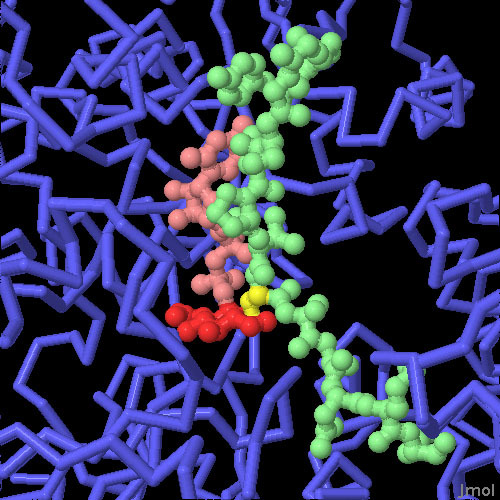 The structure included in PDB entry 3pe4 includes a short peptide (in green) from the protein that will be modified, and UDP (in red, mostly hidden behind the peptide). Bacterial hyaluronidase similar to human O-GlcNAcase. Of course, there also needs to be an enzyme to counteract the action of O-GlcNAc transferase, to remove sugars and restore the function of the unmodified protein. The enzyme O-GlcNAcase performs this task, cleaving sugars from modified protein chains. 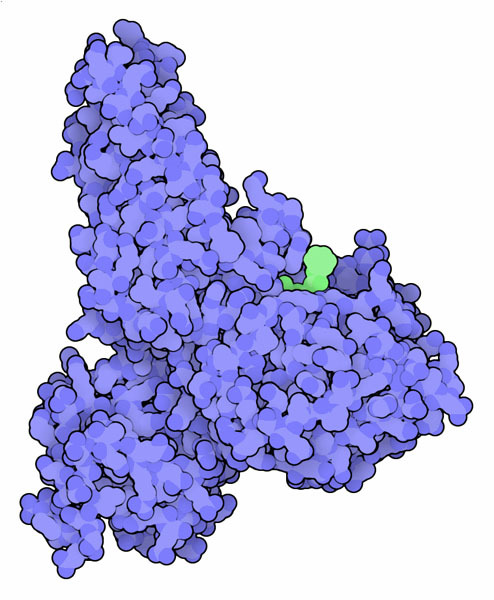 The enzyme shown here, from PDB entry 2cbj , is a bacterial enzyme similar to the one that performs this function in our cells. By combining three different structures, you can take a look at the reaction performed by O-GlcNAc transferase. PDB entry 3pe4 contains the catalytic domain and part of the protein-recognizing domain, and PDB entry 1w3b contains most of the protein-recognizing domain. Fortunately, there is a little overlap between the two, so you can do a superposition to simulate the whole protein. The structure in entry 3pe4 also includes a peptide and UDP bound in the active site. To see where the sugar binds in UDP-GlcNAc, you can look at the structure of a similar enzyme from bacteria, from PDB entry 2jlb . Click on the image here to see an interactive Jmol of these three structures. Structures are available for several other bacterial GlcNAcase-like enzymes, for instance, in PDB entry 2chn. You can overlap these structures and look for similarities using "Compare Structures" tools. O-GlcNAc transferase and GlcNAcase are both targets for drug development, because of their connection to diabetes. In the PDB, you can find several structures of these enzymes with inhibitors. G. W Hart, M. P. Housley and C. Slawson (2007) Cycling of O-linked beta-N-acetylglucosamine on nucleocytoplasmic proteins. Nature 446, 1017-1022. L. M. Gay, X. Zheng and D. M. F. van Allen (2011) O-GlcNAc transfer: size matters. Nature Chemical Biology 7, 134-135.